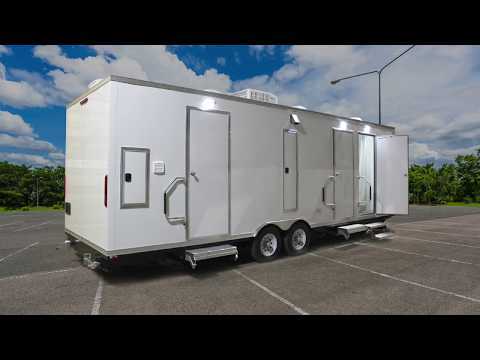 This unique custom laundry and shower trailer features individual unisex shower suites, each with lockable private entrance, stairs and exterior lighting. Each of the 6 shower suites include fiberglass shower stall, metered shower, shower curtain, bench, and corner sink. The separate laundry area includes stackable washer and dryer. Photos are used to show choice of white or grey FRP walls and may not be actual representation of unit. Please see layout for actual representation.